The perfect make-ahead meal for cold winter days! 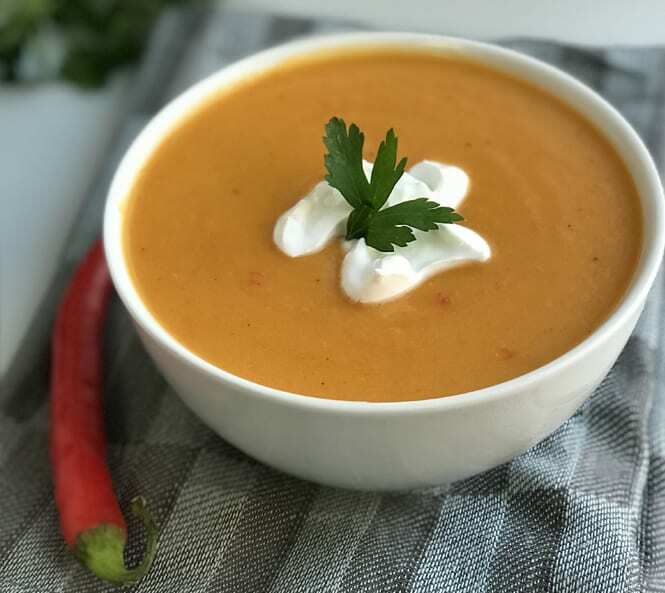 Our Coconut, Roasted Sweet Potato, and Lemongrass Soup packs a flavourful punch with our Garlic Roasted Sweet Potato Chunks serving as a hearty and delicious base. Sprinkle in spices and herbs and thicken with coconut milk to get a tangy, aromatic soup that’ll keep you full and ready for the chilliest of days! Cook the Garlic Roasted Sweet Potato Chunks as per cooking instructions on the pack. Pour the oil into a large pan at medium heat. Add the onion and carrot and sautée for 10 minutes until translucent and soft. Stir occasionally to avoid burning. Bruise the lemon grass with the back of your knife and add to the pan along with the garlic, chillies and ginger. Cook for 2 minutes. Add the sweet potatoes and stir. Sprinkle the salt and pepper and squeeze in juice of two limes. Pour in the stock and coconut milk and turn up the heat. Bring to the boil and reduce to a simmer for 15-20 minutes. Remove the pan from the heat. Take out the lemongrass stalks and blend the soup until smooth. Serve with a dollop of coconut yoghurt and some coriander.